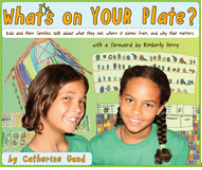 What's On Your Plate Resource Opportunity! City Rising Farm has been chosen as the latest recipient of Aubin Pictures "What's on Your Plate" Buy a Bundle, Give a Bundle Program. For each bundle, (dvd, workbook, and stuffed onion) purchased a bundle will be donated to City Rising Farm! This program will allow us to expand our ability to provide educational resources in the neighborhoods in which we serve. The link below will take you to the site where you can learn more about the program and the movie which has roots in Ohio! Please share this information with others and feel free to contact us with any questions, suggestions and/or concerns. Conversations on Work and Wealth! On October 1, 2011 a gentle wind blew in at City Rising Farm. Her name is Lara. She showed up quietly and unassumingly but the impact she has made is immeasurable! It was a cold and wet day for a plant exchange but as we always do at CRF we went on with the day’s plan. 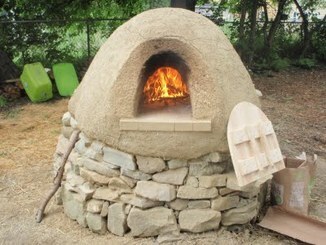 The cob oven was fired up and hot soup and warm apple cider were simmering. We stoked the fire and ate charred bread (we are still trying to perfect the cob oven bread baking process lol) and laughed all day! Still all we knew then was that this guest made us feel so comfortable, as if we had known her all our lives. As time went on we saw more and more of Lara. 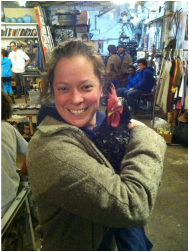 She came to help out at workshops and quickly became part of the City Rising Farm family. Her extensive knowledge in biology, the environment and education is outstanding. We are so lucky to have her as part of City Rising Farm. That gentle wind picked up velocity! 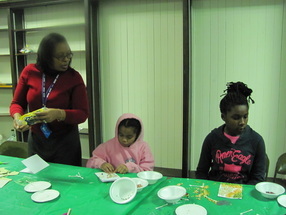 Lara started working with us on Souper Saturday and soon came on board as one of our environmental educators. 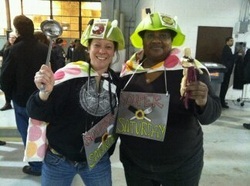 She also heads up the education department of City Rising Farm! Keep in mind that this is done on a volunteer basis while she works and pursues her doctorate. She is just amazing! 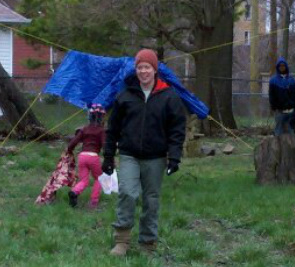 Lara is the "Pied Piper" of City Rising Farm! Lara is the "Pied Piper" of our organization. She engages everyone and there isn't a person that meets her that isn't enamored. Kids are especially drawn to her. I’ve heard them exclaim “I love you Ms. Lara”, “Where’s Ms. Lara?”, or when they don’t know her name they ask for “The Lady”. Lara can round up a bunch of kids for any activity. "I have something for you but it's not ready yet." One moment that stays with me was in December during Souper Saturday when a solemn faced youngster came in after the activities were well on the way. Lara worked with her and got her caught up in time to finish with everyone else. During the clean up period this precious little lady came back in looking for "The Lady". She said, "I have something for you but it's not ready yet." Lara smiled and said something to her although I don't know what that was. 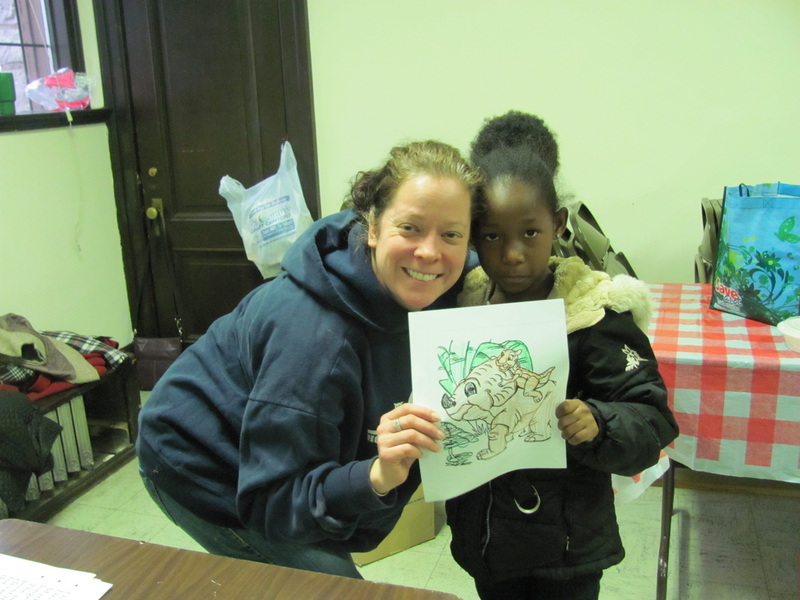 A few minutes later this young lady returned with a picture she had colored to give to Lara. Lara was so excited and thankful for this "gift" that she told our little one that she would take it home and hang it on her refrigerator with all of her other treasures. This solemn little lady was so happy to give her gift, share her talent. I was so happy to witness the exchange. It is these powerful moments that Lara Roketenetz seems to elicit like no one else can! Whether she is talking to teens about working in a lab and doing research in Canada ensuring them that they can do the same or working on any of the many environmental projects around northeast Ohio, (think wetlands restoration, tree planting in the metro parks, identifying flora and fauna at a local farm, or in costume working to raise funds for education programming in under served neighborhoods) Lara is involved at every level of our community. Did I forget to mention that Lara is also on the board of the incredible Green Triangle, Inc. the permaculture non-profit located right here in Cleveland, OH? We are so lucky to have Lara here! She always blows us in the right direction!!!! Please enjoy Lara's links below. Are you looking for a garden? The Rockefeller Greenhouse Garden is looking for you! All America Selections (AAS) Display Vegetable Garden at the City of Cleveland’s Rockefeller Greenhouse. 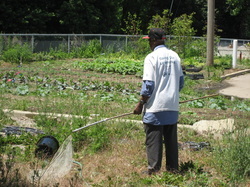 In 2012 the Rockefeller Greenhouse, with the support of Friends of Greenhouse, added an All America Selections (AAS) Vegetable Display Garden adjacent to its new Iris Garden in its expanding Southwest quadrant. 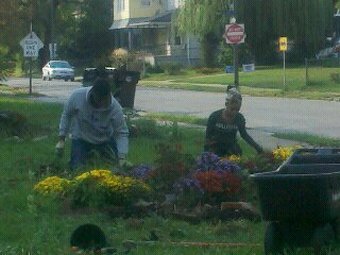 Please contact James and/or Perrin to get involved in this wonderful garden! 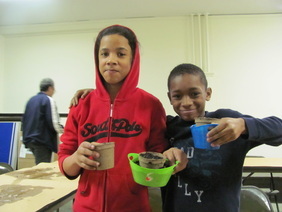 We learned how to build an herb garden that is practical and beautiful in this hands on workshop. 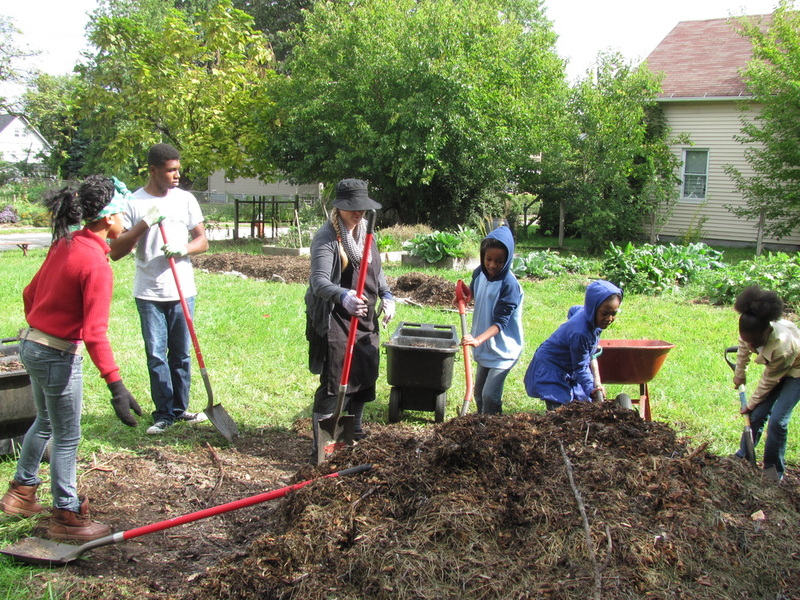 Citizens Leadership Academy students joined in the fun as Home Depot led us in sprucing up City Rising Farm with picnic tables, benches, fruit tree planting, and more. Want to learn how to make a neat stone bench? Join us for a hands on workshop on a technique developed nearly a century ago. Accenture volunteers joined City Rising Farm youth to help make the Northeast Pre-Release Center Horticulture Class vision a reality at the Blaine Avenue Community Garden. We had great conversation, food, and music as we welcomed the "Pull" group to Hough! Artist William Pope.L and SPACES invite you to be a part of Pull!, an unprecedented, citywide performance about what works means to Cleveland. Non-stop from June 7-9, hundreds of Clevelanders will manually pull a truck across the city, from North Collinwood to Ohio City. Images collected from people across Cleveland-- hopefully you included!-- about the meaning of work in our lives will be projected from the truck as it is pulled through the city. Pull! is a massive group effort, and we can't do it without you! Sign up to Pull! by May 20, and submit your images by April 30. Sponsored by all of Earth's people! 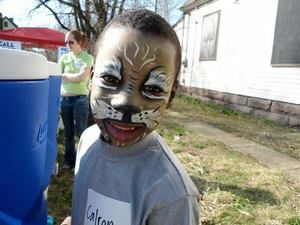 We had tons of fun as we celebrated Earth Day by painting pots and planting them with violas for people we love. We also added a fun new activity to the day, "YOGA"! Homemade soup, salad and healthy snacks will rounded out our Earth Day celebration! 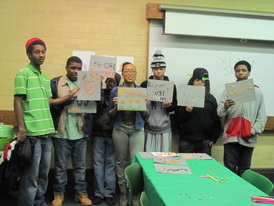 A special thank you to the Earth Day Coalition for providing the free tickets to Earthfest! We had a great time. As always please find the link to our photos from the day listed below. We started lots of plants for our gardens this year thanks to our wonderful community partner Gale's Garden Center, Willoughby Hills! Lunch was homemade tomato soup topped off with cheese and fresh salad with sunflower seeds. Stop by the library and see how our plant starts are doing! As always the link to the photos of the days activities is listed below.